I doubt we will even get a s3. I'm not sure if the judges were critics or whether they are just the mods of r/anime. 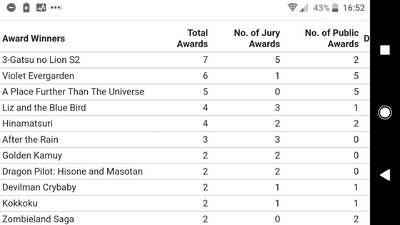 I'm guessing Liz won more jury prizes, because it was easier for 10 or so people to have seen it versus 1000s of people in the public vote. And it is very good. I hope it gets a UK release but I am importing shouts ASAP though. But it’s different art style and other differences to sound do work against it to a larger audience as it didn’t do very well in Japan. And it was nice finally seeing Dragon pilot get some love. I watched Dragon Pilot recently and it’s good fun despite some flaws near the end. ED was great as well. I didn’t care for some of the drama near the end though it wasn’t Kiznavier levels of bad or anything. Agreed it wasn’t as much of a hindrance. I’d dig a second season. Nice to see March and A place Further get a few wins. Spotted that on 21st February that BBC Radio 3's "Free Thinking" has an episode entitled 'Images of Japan' in which: "Illustrator Fumio Obata and manga translator Jocelyne Allen discuss Japanese comic book imagery and how to tell stories of disaster in graphic novels." @Ian Wolf : Thank you for the heads up! That looks really interesting, especially as Jocelyne Allen has such wide experience of translating different mangaka (although, as far as I can see Fumio Obata has nothing translated into English so far). One anime trope may be on the way out. Valentine's day episodes may never be the same again. Except that if people aren't receiving any more unnecessary giri-chocolates, there's no need for their male coworkers to reciprocate the gesture. So even guys tortured by the (completely voluntary) social obligation to return the favour of receiving gifts from their millions of female admirers are being liberated! We can all rejoice together! Chocolates for friends and families instead! 1) How is this a real thing? 2) How do I become one? So I'm looking at today's sale on Anime Online, and I'm wondering what people thought of Chobits and Maid Sama are worth a purchase of £15 each? There's mixed(ish) reviews on MAL, so wondering if they are good? Own Chobits on DVD and on Blu-ray, and Maid Sama on DVD, and I just now placed an order for the BD as well. They're good, fun, watchable, but not great. Last winter I found that Chobits didn't really stand up to an eighth viewing. But if you're only planning to watch it seven times, it's a keeper.